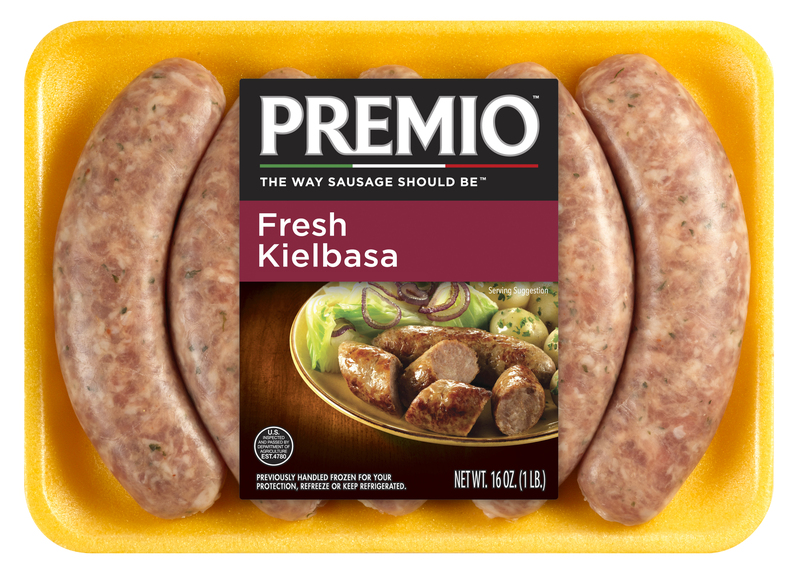 Whether you use it to make a one-skillet meal or a multi-course dinner, Premio Kielbasa brings the taste of Poland and central Europe to your table. While Kielbasa makes any entrée savory, you can also use it to make appetizers your guests won’t be able to stop eating. If you want to surprise your tailgating buddies with a distinct flavor they’ll want again and again, throw some Kielbasa on the grill and enjoy. Ingredients: Pork, Less than 2% of the following: Water, Salt, Sugar, Potassium Chloride, Garlic Powder, Natural Flavors. Sausage comes in a wide variety of types. Chorizo is smoky. Italian can be hot or sweet. Cajun has quite a bite. And breakfast takes on the taste of whatever ingredients are added to it, from apples to maple syrup. So how does kielbasa fit into this lineup of flavors? This sausage, which originated in Poland, tends to be milder than many other international flavors, but it’s no less delicious. Kielbasa holds an important place in Polish culture. It’s often served at weddings, where guests see it as a good luck charm for the bride and groom. Traditional Polish dishes such as sauerkraut, bigos and sour rye soup rely on a heavy dose of kielbasa for their flavor. It’s also served plain as a snack at many Polish tables. Premio kielbasa sausage provides a healthy protein source for just about any meal. It has an agreeable taste that fits well into other dishes, but it can stand alone as well. Whether you want something to stick in a stir fry, a meat to balance out a rice dish or a centerpiece to a quick after-work meal, kielbasa fits the bill. Family get-togethers demand food everyone will enjoy. You need things you know everyone likes. Kielbasa can offer the perfect solution. It’s so easy to make that nearly anyone could cook it. And the taste is mild enough that it will agree with those who tend to eschew spicy foods. You can prepare our kielbasa for any occasion. Don’t waste time searching through tons of menu items for a dish everyone can agree on. Start with a meat you know people will like, such as kielbasa, and then do a search on our recipes page. You will find fun dishes such as our German Octoberfest Pizza and Kielbasa ‘n Cabbage. Premio Foods started more than four decades ago with four pillars in mind. Back then, we devoted ourselves to the ideals that drove every family business: a commitment to quality, customers, community and employees. All these years later, we have kept that commitment. We proudly provide food that will help your family grow strong. And we do it while sticking to our ideals. That means finding ways to help the environment through our business, such as reducing the amount of packaging we use on our foods. It also means encouraging our employees to take time to give back in the community and recognizing those outstanding efforts. We take a great deal of pride in the people we hire and the customers we serve, and we appreciate you allowing us to be a part of your family. Order from us online today or find a nearby store that sells Premio Foods sausages.